When you save items from your internet browser to your Zotero library, Zotero collects information that will allow you to insert your bibliography quickly. There are a few ways to insert your bibliography: insert using the Word plugin (recommended), drag-and-drop, or copy-and-paste. 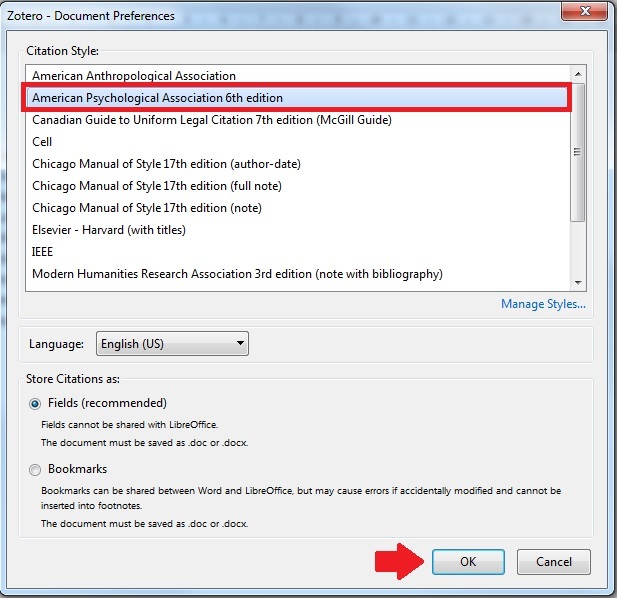 Before all that though, it is a good idea to set up your default citation style, so that if you choose to drag-and-drop your bibliography it automatically formats according to your preferred citation style. See the fourth tab, titled "Citation Preferences", for details on how to do this. It is strongly recommended that you insert citations and bibliography/works cited lists into your word document by using the Zotero Plugin in your word processor. This is a better choice because it updates as you work, and you can edit the style all at once instead of manually. This is the best option if you are planning to resubmit your work to various publications that require different styles, and is also the best style for if you are inserting citations as you go. It requires a bit of effort, but it keeps your work better organized and makes it easier to update your work. 1. 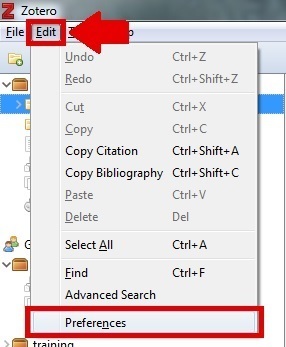 When you have started writing your paper and you're ready to add a citation, click on the Zotero tab in your word processor (this example shows how to add citations and bibliographies using Microsoft Word) and then click "Add/Edit Citation". Make sure you've placed your cursor where in the sentence you want to insert the citation. 2. Once you've selected "Add/Edit Citation" then a window will pop-up asking you which citation style you are using. In this example, APA is the preferred style. Select the style you need, then hit "OK". 3. Now that you've chosen a style, a small red field will pop up in your Word document; type in the first few letters of an author you want to use, and you will see the entry in Zotero appear. Click the entry (highlighted in Blue). 4. Once you've clicked the title, the name of the author followed by the date will appear in the red Zotero field. Hit "Enter" on your keyboard. 5. Now you should see the citation for the author and the date in your text. Note that you will need to enter the page number, as Zotero cannot input this information for you. Once you have inserted one citation, you can create a bibliography or work cited list. To create a list based on the citations you have inserted, click "Add/Edit Bibliography" in the Zotero tab of your word processor. When you click this, you will see a list automatically populate at the bottom of your document. 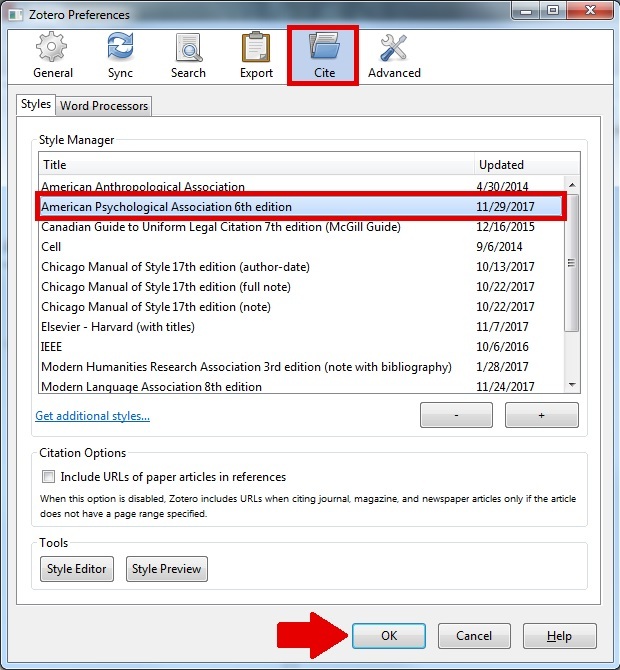 As you add citations, your bibliography will update automatically. To remove a citation, simply delete the in-text reference, and then click "Refresh" in the toolbar of the Zotero word tab. If you wish to drag-and-drop your bibliography, you must first update your citation style preferences. This will automatically format the bibliography to your preferences. 2. Go to "Edit" then click "Preferences"
3. Select which style you want as your default style. In this example, we have selected APA. Hit "OK". 4. Your default style should now be set to whichever citation style you selected. 5. Now that your default has been set, select one or more items from your library (CTRL-A to select all; Shift-and-click to select only a few). 6. Next, drag the items to a Word document. In Word, it should automatically format to the style you set as your default. Note: Sometimes Zotero makes mistakes. The majority of these citations are correct, but a couple of them have small errors. The best way to avoid these mistakes is to make sure the items are correct in Zotero before you drag them to Word. That means making sure the page-numbers are complete, and that the titles are in sentence case. That way, your citations will be mostly correct when you insert them into Word, and you can save yourself time and frustration. Copying and pasting your bibliography is almost as fast as the drag-and-drop method, and will allow you to select your preferred method as you copy. 1. Select one or more items from your library that you want to include in your bibliography (CTRL-A to select all; Shift-and-click to select only a few). 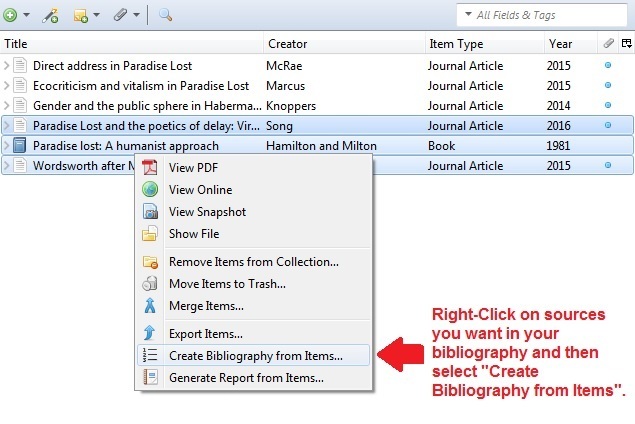 Right click on the items (CTRL-Click on Mac) and select "Create Bibliography from Items". 2. 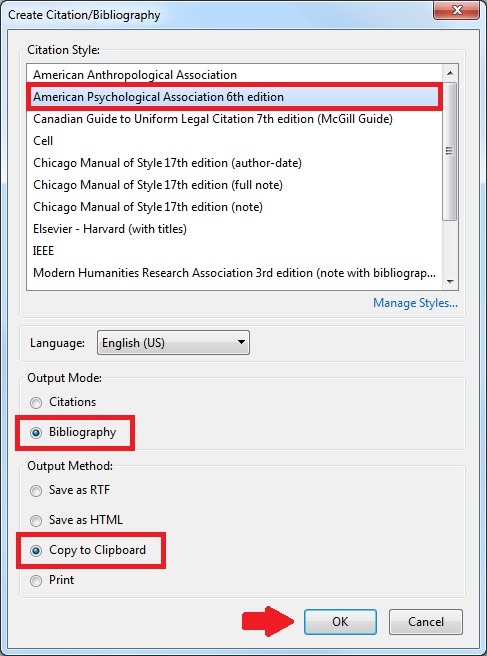 When you have selected "Create Bibliography from Items" you will be able to choose which citation style you want to format your bibliography or Work Cited list as. Ensure you have chosen "Bibliography" under "Output Mode". For "Output Method" select "Copy to Clipboard". This will allow you to paste the items as a list in your Word document. Hit "OK". 3. Once you have hit "OK" go to your Word document and place the cursor where you want your bibliography to be. CTRL-V to paste, or paste from Clipboard. You should now see your completed bibliography. 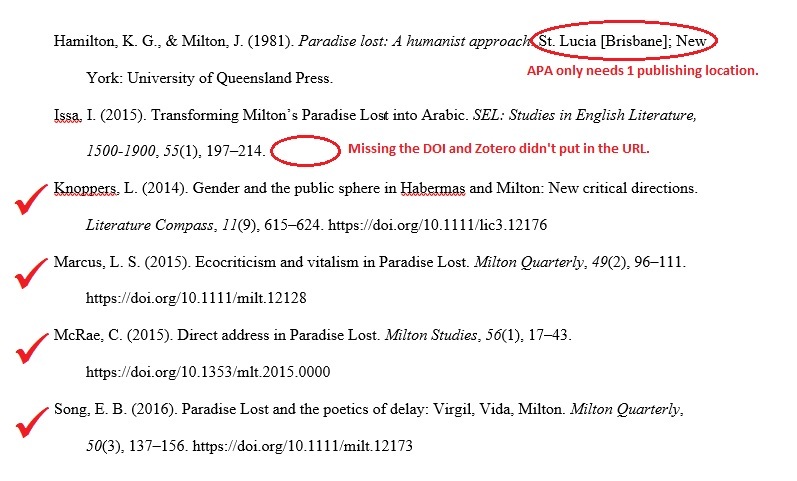 In the following example, note the error in the second item; it has listed two locations for the book's place of publication. Remember, Zotero will input whatever information is attached to the item in your Zotero Library, so it's a good idea to ensure your item is correct before you copy-and-paste the bibliography into your Word document. Congratulations, you have now copied-and-pasted your bibliography from Zotero into Word! If you wish to drag-and-drop your bibliography, you must first update your citation style preferences. 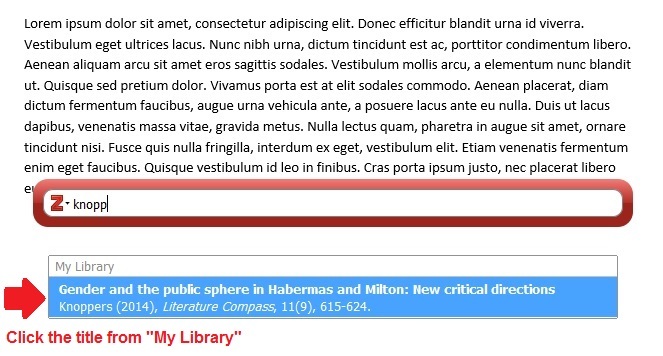 This will automatically format the bibliography to your preferences, should you choose to drag-and-drop it.